Images made with ESO's New Technology Telescope at La Silla by a team of German astronomers reveal a rich circular cluster of stars in the inner parts of our Galaxy. Located 30,000 light-years away, this previously unknown closely-packed group of about 100,000 stars is most likely a new globular cluster. 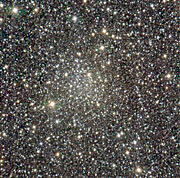 Star clusters provide us with unique laboratory conditions to investigate various aspects of astrophysics. They represent groups of stars with similar ages, chemical element abundances and distances. Globular clusters, in particular, are fossils in the Milky Way that provide useful information. With ages of about 10 billion years, they are among the oldest objects in our Galaxy - almost as old as the Universe itself. These massive, spherical shaped star clusters are therefore witnesses of the early, mysterious ages of the Universe. "Moreover, the properties of globular clusters are deeply connected with the history of their host galaxy," says Dirk Froebrich from the University of Kent, and lead-author of the paper presenting the results. "We believe today that galaxy collisions, galaxy cannibalism, as well as galaxy mergers leave their imprint in the globular cluster population of any given galaxy. Thus, when investigating globular clusters we hope to be able to use them as an acid test for our understanding of the formation and evolution of galaxies," he adds. In our own Galaxy about 150 globular clusters are known, each containing many hundreds of thousands of stars. In contrast to their smaller and less regularly shaped siblings - open clusters - globular clusters are not concentrated in the galactic disc; rather they are spherically distributed in the galactic halo, with increasing concentration towards the centre of the Galaxy. Until the mid 1990s, globular clusters were identified mostly by eye - from visual inspection of photographic plates. However, these early searches are likely to have missed a significant number of globular clusters, particularly close to the disc of the Galaxy, where dense clouds of dust and gas obscure the view. In the early times of extragalactic astronomy this area was called the 'Zone of Avoidance' because extragalactic stellar systems appeared to be very rare in this part of the sky. Searching for the missing globular clusters in our Galaxy requires observations in the infrared, because infrared radiation is able to penetrate the thick 'galactic fog'. Using modern, sensitive infrared detectors, this is now possible. Completing the census is not only a challenge for its own sake, as finding new globular clusters is useful for several additional reasons. For example, analysing their orbits allows astronomers to draw conclusions about the distribution of mass in the Galaxy. 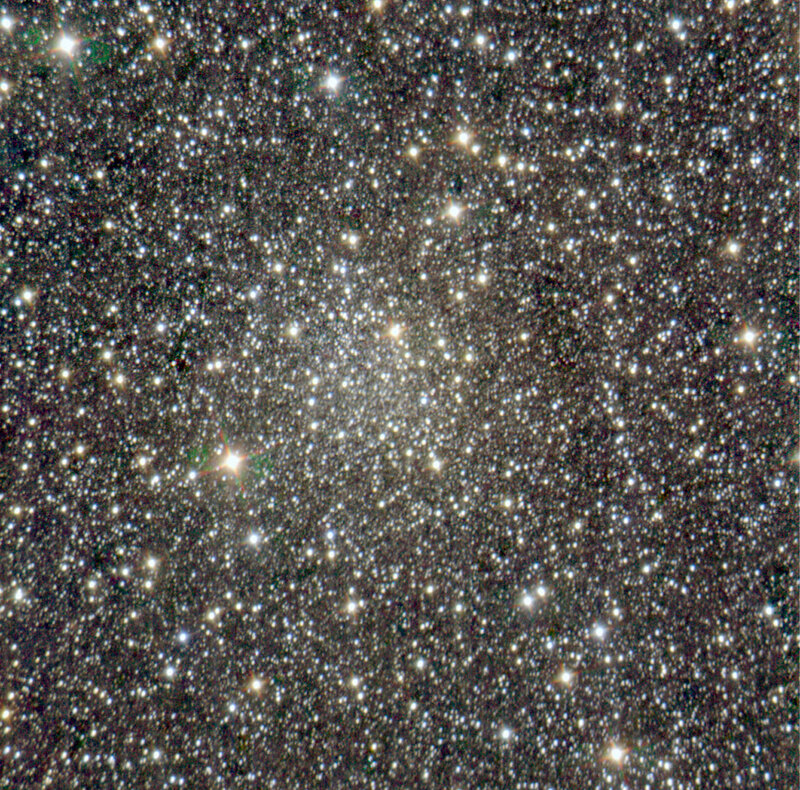 Star clusters can therefore be used as probes for the large-scale structure of the Milky Way. "It has been estimated that the region close to the Galactic Centre might contain about 10 so far unknown globular clusters and we have started a large campaign to unveil and characterise them," explains Helmut Meusinger, from the Thüringer Landessternwarte Tautenburg, Germany, and part of the team. The astronomers carried out a systematic and automated large-scale (14,400 square degrees) search for globular cluster candidates in the entire Galactic Plane, based on the near-infrared Two Micron All Sky Survey (2MASS). Eventually, only about a dozen candidate objects remained. The astronomers observed these candidates with the SofI instrument attached to ESO's New Technology Telescope (NTT) at La Silla (Chile), taking images through three different near-infrared filters. The new images are ten times deeper and have a much better angular resolution than the original 2MASS images, thereby allowing the astronomers to resolve at least partly the dense accumulation of stars in the globular cluster candidates. One of these candidates had the number 1735 in the list of Froebrich, Scholz, and Raftery, and is therefore denoted as FSR 1735. "The unique images we have obtained reveal that the nebulous appearance of the cluster in previous images is in fact due to a large number of faint stars," says Froebrich. "The images show a beautiful, rich, and circular accumulation of stars." From a detailed analysis of the properties of the cluster, the astronomers arrive at the conclusion that the cluster is about 30,000 light-years away from us and only 10,000 light-years away from the Galactic Centre, close to the Galactic Plane. "All the evidence supports the interpretation that FSR 1735 is a new globular cluster in the inner Milky Way," says Aleks Scholz, from the University of St Andrews, UK, and another member of the team. "However, to be sure, we now need to measure the age of the cluster accurately, and this requires still deeper observations." The cluster is about 7 light-years wide (slightly less than twice the distance between the Sun and its nearest star, Proxima Centauri) but contains about 100,000 stars for a total estimated mass of 65,000 times the mass of the Sun. The stars contain between 5 and 8 times less heavy elements than the Sun. "On its way to our Solar System, the light coming from the stars in the FSR 1735 cluster has to penetrate a thick cloud of dust and gas," says Meusinger. "This is one of the reasons why this cluster was hard to find in previous surveys." "Is this now the last missing globular cluster in our galaxy?," asks Scholz. "We really can't be sure. The opaque interiors of the Milky Way may well have more surprises in store." The team is composed of Dirk Froebrich (University of Kent, UK), Helmut Meusinger (Thüringer Landessternwarte Tautenburg, Germany), and Aleks Scholz (University of St Andrews, Scotland, UK). This research is presented in an article in press in the Monthly Notices of the Royal Astronomical Society ("FSR 1735 - A new globular cluster candidate in the inner Galaxy", by Froebrich et al. ).